This article is about the manufacturer. For the automobile engineer and company founder, see Giotto Bizzarrini. Bizzarrini S.p.A. was an Italian automotive manufacturer in the 1960s founded by former Alfa Romeo, Ferrari and ISO engineer, Giotto Bizzarrini. 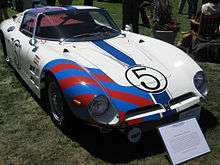 The company built a small number of highly developed and advanced sport and racing automobiles before failing in 1969. Notable models include the 5300 GT Strada and the P538S. Giotto Bizzarrini was born in Livorno, Italy in 1926. His father was a rich landowner who came from a family with strong roots in Tuscany and the city of Livorno. His grandfather, also named Giotto Bizzarrini, was a biologist who had worked with Guglielmo Marconi on his inventions, especially the radio, following which one of the Livorno Library sections was named The Bizzarrini Library. 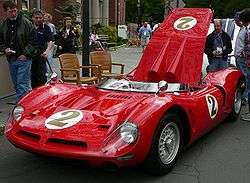 Bizzarrini graduated as an engineer in the University of Pisa in 1953. He taught briefly before joining Alfa Romeo in 1954. He worked for Alfa Romeo from 1954 to 1957. He began working for Ferrari in 1957, eventually becoming controller of experimental, Sports and GT car development. He worked at Ferrari as a developer, designer, test driver, and chief engineer for five years. His developments there included the Ferrari 250 TR, the Ferrari 250 GT SWB (Short Wheelbase Berlinetta or Berlinetta Passo Corto), and the 1962 Ferrari 250 GTO. Bizzarrini was fired by Ferrari during the "palace revolt" of 1961. He became part of Automobili Turismo e Sport (ATS)), a company started by the ex-Ferrari engineers to build a Formula 1 single seater and a GT sport car, the A.T.S. Serenissima. One of ATS's financial backers, Count Giovanni Volpi, owner of Scuderia Serenissima, hired Bizzarrini to upgrade a Ferrari 250 GT SWB, with chassis number #2819GT to GTO specifications. 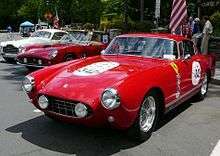 This resulted in the Ferrari 250 GT SWB Drogo also known as the "Breadvan". 1964 Bizzarrini Iso Grifo Berlinetta 5300 Corsa (Grifo AC3 body and Corvette 327 cu in (5,360 cc) engine). The Iso Rivolta GT was a Giugiaro designed four seater with beautiful body, speed, comfort and handling, and was a successful car for ISO with 799 units sold. Powered by a 327ci Chevrolet Corvette V8 engine with a classic De Dion rear suspension design with pressed steel monocoque bodywork over pressed steel frame chassis. Unveiled to the press in 1963, production continued until 1970. The Iso Grifo A3L was a monstrous idea for a super coupé, the L coming from Lusso. The result of the brilliant Giugiaro and Bizzarrini working together, it was based on a shortened Iso Rivolta GT chassis and was debuted at the 1963 Turin show. The Grifo epitomised the 1960s Italian style with its handsome low and wide handmade bodywork. It was the fastest production car tested by Autocar Magazine in 1966 with a top speed of 160 mph (260 km/h). Later versions of the Grifo were powered by a big block Chevrolet Corvette 435 bhp (324 kW; 441 PS) engine. These 90 handbuilt units are distinguishable by the raised "pagoda style" scoop bonnet. Some of these Iso Grifo 7 Litri units were rebuilt later with even bigger engines. Around 29 A3C sport cars were built under the ISO name. Five of these 29 cars were bodied in plastic/fiberglass by Piero Drogo at Carrozzeria Sports Cars in Modena. A3Cs were widely raced. Some cars entered the 1964 and 1965 Le Mans 24 hour, 1965 Nürburgring 1000 and 1965 Sebring. It achieved a Le Mans class win in both years and a 9th overall in 1965 with no factory support. A3Cs were one of the fastest cars on LeMans' Mulsanne Straight in both years. Giotto Bizzarrini was a dedicated race car designer and builder. Likely one of the sources of disagreement between Renzo Rivolta and Giotto Bizzarrini was Bizzarrini’s desire to build race cars and Renzo Rivolta’s desire to build high quality GT cars and family transportation cars. They decided to part ways in 1964. Bizzarrini had mixed success in racing. The lowlight for Bizzarrini must certainly have been the Sebring 12 Hours on March 27, 1965 where both Iso/Bizzarrini race cars were heavily crashed and totaled. The highlight came later that same year at the 24 Hours of Le Mans on June 19–20, 1965 where an Iso Grifo/Bizzarrini won the 5000 CC and over class and was ninth overall. C. Rino Argento helped Bizzarrini manage the race cars during that terrible week in June 1965 at Sebring. He has written a detailed account of that week which was originally published in the Griffon, the magazine of the Iso & Bizzarrini Owner’s Club. Car No. 8, driven by Silvio Moser, went off track due to brake failure and crashed into a VW bus. Fortunately no one was injured but the car was a total loss. Later during a very heavy rain storm car No. 9, driven by Mike Gammino aquaplaned, hit the pedestrian bridge and split in two. The car split right behind the driver and Mike Gammino did not realize how close he came to being killed until he stepped out of the car. The famous California race car builder, Max Balchowsky, was also at Sebring helping the Bizzarrini team. He took all of the pieces of these two Iso/Bizzarrini race cars back to his shop in Southern California with the intention to build one Iso/Bizzarrini from the pieces of the two destroyed cars. This recreated Iso/Bizzarrini race car has never been seen again. There was a morbid end to the week; a plane crash killed Iso and Bizzarrini supporter, Mitch Michelmore and his son as they were on their way back to California. Michelmore “had a Chevrolet dealership in Reseda, California and he had sold quite a few Iso Rivoltas; he was enthusiastic about the cars and interested in the racing version (the Grifos) and was seriously considering a sales activity for them in this country” according to C. Rino Argento. At least three 5300s were turned out as beautiful Style Italia designed spyder/targa versions, all of which survive and are currently owned by the same person. Bizzarrini also managed a scaled-down 5300 GT project. Designed for GM-Opel, it was based on Opel 1900 platform. Bizzarrini's proposal was more aggressive and good looking. It was a baby-looking 5300 GT. The production Opel GT was designed by factory stylists and was less aggressive but still beautiful. Bizzarrini then decided to build the car himself. Around 17 prototypes were completed. The car is officially named as the Bizzarrini 1900 GT Europa. One of these cars has a barchetta body. Some cars are powered by 1300 and 1600 four cylinder engines sourced from GM, Alfa Romeo and FIAT. There is even a highly developed racing version with SPICA fuel injection system. Bizzarrini's advanced ideas emerged again with the superb Bizzarrini P538S, P for posteriore, 53 for the 5300 cc Corvette engine, 8 for V8 engine and S for Sportcar. The first V-12 car was ordered by USA racer Mike Gammino. This ultra low barchetta raced in the 1966 Le Mans (DNF) and was entered in 67 even but did not start (DNQ). In 1966, after a spin at the very start line, it lasted less than a half an hour and retired by a cracked oil pipe. During the short race time, the P538 was clocked as one of the fastest cars down the Mulsanne Straight. 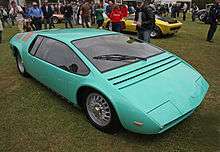 In 1968, Giugiaro rebodied one of the P538 as the famous Bizzarrini Manta. After some years in Sweden, it was dismantled for an extensive restoration. Later featured in various classics cars events, it now resides in USA. Officially three or four chassis were originally built in period, destined to race in USA by Mike Gammino and Le Mans. Today, not less than a dozen (or more) chassis are in existence today, some of these fakes claiming to be the real cars raced in Le Mans. At least two of these replicas are Lamborghini V12 powered. These V12 powered cars were truly the long waited Bizzarrini dream: his own engine and own chassis. In 1990, Bizzarrini was involved in the design of a one-off supercar model. Based on Ferrari Testarossa bits, Bizzarrini and his team designed a superb car. The Bizzarrini BZ-2001 is the true follower of the P538. The car was the first one of a supposed production run, but only one more car was completed. In 1989 a group of young friends living in Ascoli Piceno, with a strong passion for motor sport, had the idea to establish a company constructing "copies" of the cars manufactured in the past by Giotto Bizzarrini. During their first encounter, the Tuscan motor genius expressed a kind of animosity towards this idea; he refused to support the project and he turned the group of friends out. Nevertheless, their motivation was so strong that, after a short briefing of about half an hour, they presented an alternative proposal: to construct a sports car. The result was the Picchio Barchetta, powered by BMW engines. The cars were successfully raced in the Italian Hillclimb Championship and Italian Sport Championship. The Kjara project was born in 1998. The Scuderia Bizzarrini built this sport barchetta in close collaboration with Leone Martellucci of University La Sapienza of Roma. The car is powered by a parallel hybrid propulsion system with a 2.5 litre TurboDiesel Lancia engine and a 40 kW (54 hp) AC electric drive; it was shown at Turin Auto Show 2000. At the 2005 Geneva show, the new owner of the marque Bizzarrini showed the new GT Strada 4.1 concept, a two-door GT with a 4.1-litre 550 bhp (410 kW; 558 PS) plant (maximum speed - 360 km/h (220 mph), 0–100 km/h in 3.8 sec.) and was planned for production in 2007. Jack Koobs de Hartog/ Rodolphe de Biolley/ Olczyk Philippe: Bizzarrini: The Man, his Projects and His Cars. ISBN 9952-8002-0-7. Winston Goodfellow: Iso Rivolta, The Man, The Machines. Motorbooks International 2001. ISBN 88-7911-268-6. Flavio Campetti: Da Iso a Isorivolta: il fascino di un marchio. Giorgio Nada. ISBN 88-7911-319-4. 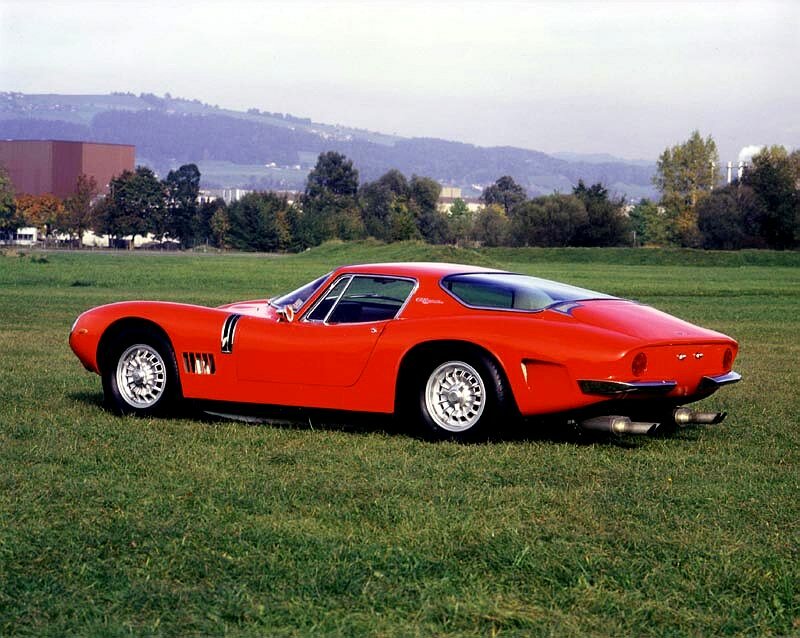 ISO and BIZZARRINI Gold Portfolio 1962–1974. Brookland Books. ISBN 1-85520-239-5. 1 2 "Two Crashed Iso Grifo/Bizzarrini Race Cars Are Still Missing - Sebring 12 Hours 1965 - Part 1". mycarquest.com. Retrieved 21 April 2015. ↑ "Image: Bizzarrini_5300GT_1969.jpg, (800 × 638 px)". arcadiadreams.com. 4 June 2004. Retrieved 3 September 2015. ↑ "The Three Bizzarrini Spyders Were A Big Hit In The Poconos!". mycarquest.com. Retrieved 21 April 2015. ↑ "Giotto Bizzarrini Receives An Honorary Doctorate From the University of Florence (Italy)". mycarquest.com. Retrieved 21 April 2015. Wikimedia Commons has media related to Bizzarrini vehicles.